ITW Formex materials areÂ polypropylene grades that carry UL 94V-0 flame class rating. Used mainly as electrical insulator, Formex and Formex GK offer scoring, folding, and bending characteristics suited for 3D parts fabrication for electronics. Statex has same basic properties and provides static-dissipative ESD protection. ITW Formex, Formex GK, and Statex are extruded into stock forms and supplied as rolls, sheets, or panels ready for processing. Custom die cut fabrication is available. ITW Formex materials are flame-retardant grades of polypropylene that have high dielectric strength, low moisture absorption, and a UL 94V-0 flame class rating. Used mainly as an electrical insulator, Formex and Formex GK also exhibit exceptional scoring, folding, and bending characteristics. This makes these materials an excellent choice for cost-effective, 3D parts fabrication for industrial and consumer electronics. Statex, a similar product, has these same basic properties and provides static-dissipative ESD protection. ITW Formex, Formex GK, and Statex are extruded into stock forms and supplied as rolls, sheets, or panels that are ready for processing. Interstate Specialty Products uses precision die cutting to fabricate custom Formex parts in a variety of shapes and sizes with tight tolerances. In addition to steel rule die cutting, we can convert Formex materials with rotary die cutting, an efficient in-line process. Depending on your needs, order quantities can range from minimum volumes to full-scale production runs. Die-cut Formex materials can be fabricated into internal mechanical components such as air flow baffles and wire harness organizers, and used in place of more expensive plastic injection molded or metal parts. Because they won’t readily crack or split, die-cut Formex parts can be shipped flat to save freight costs. Die-cut Formex parts also support lamination with metal foils for EMI/RFI shielding. Formex flame-retardant electrical insulation materials offer chemical resistance, meet RoHS requirements for hazardous substances, and have a UL yellow card. Applications include computers and computer peripherals, uninterruptible power supplies, telecommunications and medical equipment, lighting, auto parts, and consumer products such as televisions and appliances. Does your application require flame-retardant, electrically-insulative parts? 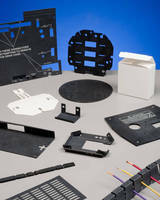 Would you like to learn more about how die-cut Formex parts can help reduce shipping costs and support final assembly? To learn how Interstate Specialty Products’ die-cutting capabilities can support your application, contact us on-line or call (800) 984-1811.